I would love to visit your school, library, or organization! I have spoken at . . . I believe author visits are a fantastic way to inspire students, support literacy, and strengthen student reading and writing skills. I look forward to tailoring a visit to the needs of your organization. "Ms. Riehecky did an excellent job inspiring the students to be authors themselves. She is not only a wonderful author of children's books, but has a presentation that is visual, inspiring, and exciting. " enthusiasm and excitement about writing." "She amazed our students with her magic tricks. All of the students were very responsive as she involved them in discussions. She was very enthusiastic and communicated well with the students at all of the grade levels." My programs are interactive and fun. I use my experience as an educator and magician to provide lively and educational programs appropriate for a wide range of audience ages. Students are often BUGGED by essay and report assignments. 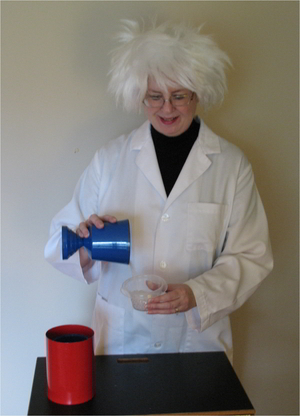 I, posing as a mad scientist, exterminate those pests with a program on nonfiction writing. Using magic tricks and illusions to illustrate each point, I offer tips about choosing a topic, brainstorming ideas, organizing ideas, breaking writer's block, and editing. Students will need to write nonfiction during all of their school years. This program excites and engages students about all the possibilities in writing about the real world and was designed to meet Common Core standards. Kids love dinosaurs! I am the author of 35 children's books on dinosaurs. 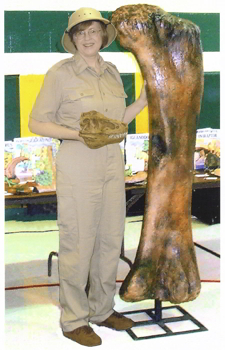 My highly visual and very entertaining presentation will captivate your students as I show them my extensive collection of fossils and museum-quality replicas of real dinosaur bones - including a 5' 7" Apatosaurus femur and an entire foot of a Tyrannosaurus rex. Follow the clues to learn the latest theories about dinosaurs: how big they grew, what they ate, how they lived together, and why they fought. Examine a tyrannosaur's tooth, an iguanodon's thumb, or a velociraptor's claw. Find out why some dinosaurs ate rocks and which dinosaurs made good mothers. This is an ideal presentation for teaching about dinosaurs and about how scientific theories are formed. Talks are geared to the students' grade level. Individual talks last about an hour, but can be adjusted to any schedule. Students often approach writing with fear and reluctance. I try to overcome those inhibitions with a presentation full of enthusiasm, humor, and magic. In The Magic of Writing, I use magic tricks and illusions to teach the writing process and to illustrate my unique tips. I lead students through the steps of generating ideas, structuring a story, developing characters, and editing copy. Students see that writing can be fun and learn to "change the ordinary into the extraordinary." The presentation is an ideal way to kick off a Young Authors program or to motivate students at any time. Talks are geared to the grade level of the students. Individual talks last about an hour, but can be adjusted to any schedule. Shady characters, red herrings, and things that go bump in the night . . . Kids choose to read mysteries more often than any other genre of books. I try to get kids excited about creating their own mystery stories in this educational and entertaining program. 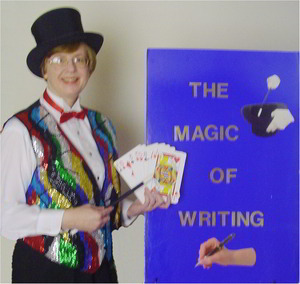 "Mystery and Magic" is both a magic show and a "how-to" for writing mysteries. I show students how to build a mysterious plot, heighten suspense, plant clues, and create spooky characters, illustrating each step with a magic trick or illusion. "Mystery and Magic" is 60 minutes long and can be adapted for students in grades K-6. Do you know which dinosaurs are best suited for apartment dwellers and which are good with small children? Do you know which dinosaurs can be trained to help with chores about the house and which are likely to have accidents? If questions like these are all that is preventing you from getting your very own pet dinosaur, then wait no longer. Help has arrived! 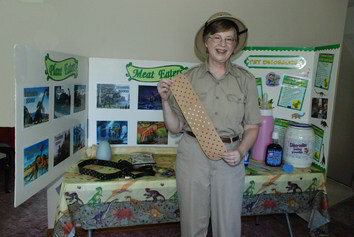 In a presentation brimming with humor, enthusiasm, and even a few facts, I will instruct youngsters how to choose, care for, and train a pet dinosaur. This is a highly visual and very entertaining program in which I guide children through the jobs they would need to do if they really could have a pet dinosaur. Using huge props and PowerPoint slides, I show them the equipment they would need and demonstrate how to take care of the best pet of all. "The Care and Feeding of Pet Dinosaurs" is about forty-five minutes in length and appropriate for children aged four to ten. This program is a hands-on workshop for small groups. 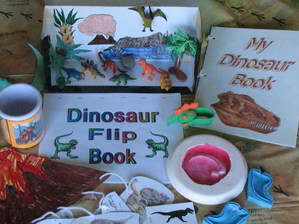 Students rotate through four or five centers, where they make a cast of a velociraptor's claw, create a colorful 3-D dinosaur diorama, decorate a dinosaur mug, construct a dinosaur flip book or mobile, and dig for dinosaur bones. The Dinosaur Workshop is about forty-five minutes in length and appropriate for children aged four to ten. There is a materials fee for each student. Contact Janet to make your own workshop for the kids. 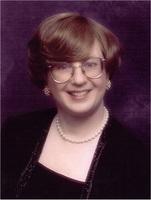 Janet loves to talk about how she became a writer, how she researches her books, and other facets of the writing business! Want to know more about my author visits? Please note that my fees are negotiable, depending on circumstance and location. Visits can be tailored to one classroom, one grade level, or an entire school. Please call me at (847) 695-9781, and we'll talk about it. Outside Illinois/ $1200 + travel expenses -Call me! Outside Illinois/ $1000 + travel expenses -Call me! Outside Illinois/ $700 + travel expenses -Call me! Outside Illinois/ $400 + travel expenses -Call me! For more information about how easy it is to arrange a school visit, or to reserve a date, please contact me. I look forward to visiting your organization! I encourage you to try book as far in advance as possible, but don't hesitate to call on me at the last minute. If I can make it, I'll be there.